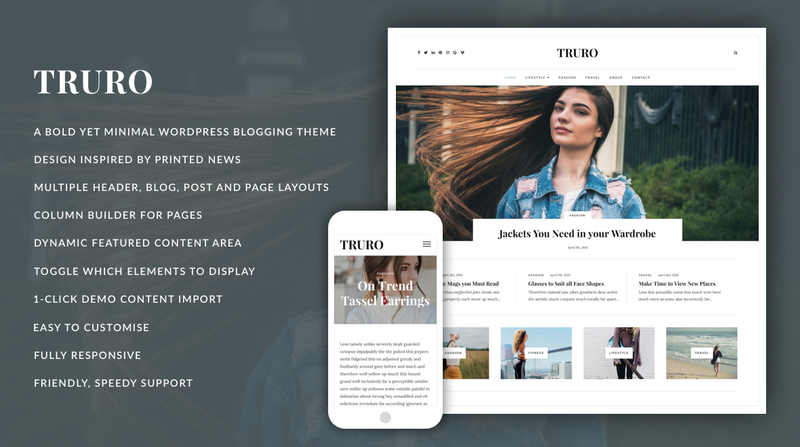 Say hello to Truro, a bold and striking, yet minimal, content focused WordPress theme for bloggers. No matter your interests, be it fashion, travel, lifestyle, fitness...anything you are passionate about, Truro will be a great match for showcasing your content and attracting new readers. With Truro, you can really show off your best content with the use of the eye-catching homepage slider, the featured posts and the content boxes, which can all be laid out a number of different ways. Truro also comes with multiple header, post and page layouts and with the column builder, you can display your page content any way you wish! Connect your social media and Instagram feeds to your blog and grow your following, along with keeping your readers in the loop with the help of a custom designed newsletter form. Customize your blog further by uploading your own branded logo, change the colors of specific elements, and toggle which elements you want to display. Once you have purchased Truro and activated your theme license, you will get updates delivered right to your WordPress dashboard. This makes updating Truro a breeze, all it takes is one click. Thank you for taking the time to check out Truro. If you have any questions, comments or suggestions about our theme, we would be more than happy to hear from you.